Signs of aging in facial skin correlate with lifespan and chronic disease; however, the health of aging skin has not been extensively studied. In healthy young skin, the dermis forms a type III collagen-rich dermal papilla, where capillary vessels supply oxygen and nutrients to basal epidermal cells. Chicken eggshell membranes (ESMs) have been used as traditional medicines to promote skin wound healing in Asian countries for many years. Previously, we designed an experimental system in which human dermal fibroblasts (HDFs) were cultured on a dish with a solubilized ESM (S-ESM) bound to an artificial phosphorylcholine polymer; we found that genes that promoted the health of the papillary dermis, such as those encoding type III collagen, were induced in the S-ESM environment. The present study found that a gel with a ratio of 20% type III/80% type I collagen, similar to that of the baby skin, resulted in a higher elasticity than 100% type I collagen (p < 0.05) and that HDFs in the gel showed high mitochondrial activity. Thus, we decided to perform further evaluations to identify the effects of S-ESM on gene expression in the skin of hairless mice and found a significant increase of type III collagen in S-ESM. Picrosirius Red staining showed that type III collagen significantly increased in the papillary dermis after S-ESM treatment. Moreover, S-ESM application significantly improved human arm elasticity and reduced facial wrinkles. ESMs may have applications in extending lifespan by reducing the loss of tissue elasticity through the increase of type III collagen. Eri Ohto-Fujita, Miho Shimizu and Yoriko Atomi contributed equally to this work. The online version of this article ( https://doi.org/10.1007/s00441-018-2954-3) contains supplementary material, which is available to authorized users. The skin is the outermost tissue and is useful for monitoring signs of aging and health. Facial appearance reflects longevity (Gunn et al. 2013) and heart block (Roshdy et al. 2018). Skin wrinkles (Vierkotter et al. 2015) and elasticity (Çildağ and Çildağ 2017) are also correlated with lung fibrosis. Therefore, additional studies of the mechanical properties of the extracellular matrix are needed. The skin consists of the epidermis, basement membrane, as the epidermis–dermal interface dermis and subcutaneous tissue. The dermis has two distinct layers, the superficial papillary dermis and the underlying reticular dermis. In young healthy skin, the dermis forms the papillary layer, which pushes up the epidermis. In the papillary layer, the cellular environment is composed of capillary vessels, which supply oxygen and nutrients to the basal epidermal cells (Archid et al. 2012; Auer et al. 1994; Braverman 1983; Konttinen et al. 2003; Sauermann et al. 2002; Wang 2005; Wang et al. 2003), type III collagen (Meigel et al. 1977) and decorin (Schonherr et al. 1993). The mechanical function of type III collagen has not been fully elucidated; however, ruptured blood vessels and wounded skin have been reported in Col3a1−/−mice (Liu et al. 1997), whereas dermal and blood vessel collagen fibrillogenesis was affected in Col3a1 mutant mice (D'Hondt et al. 2018). Thus, type III collagen is essential for tissue integrity and homeostasis, including that of the skin. In aged skin, dermal collagen synthesis and cell populations decrease and matrix metalloproteinase (MMP) levels increase (Chung et al. 2001; Varani et al. 2000). Additionally, dermal thickness decreases with the loss of dermal collagen content (Castelo-Branco et al. 1994; Kurban and Bhawan 1990). Moreover, as the capillaries decrease, nutrient supply from capillaries to the epidermis becomes difficult (Vybohova et al. 2012). When the skin becomes thinner, the influence of ultraviolet rays on the cells becomes stronger, resulting in DNA damage and apoptosis (Gilhar et al. 2004). This can cause a vicious cycle of increased skin damage; thus, prevention of skin aging and damage is urgently needed. In China and Japan, chicken eggshell membranes (ESMs) have been used as wound dressings for more than 400 years. ESM mainly consists of collagen types X, V and I, cysteine-rich proteins (Arias et al. 1991; Wong et al. 1984), proteoglycans (Arias et al. 1992; Du et al. 2015; Ha et al. 2007) and hyaluronic acid (Liu et al. 2014). We investigated the effects of ESMs on cells in our previous study and showed that moderate amounts of solubilized ESMs (S-ESMs) retained the cells in a healthy state (Ohto-Fujita et al. 2011). Moreover, human dermal fibroblasts (HDFs) adhered to a dish with S-ESM bound to a particular environment. 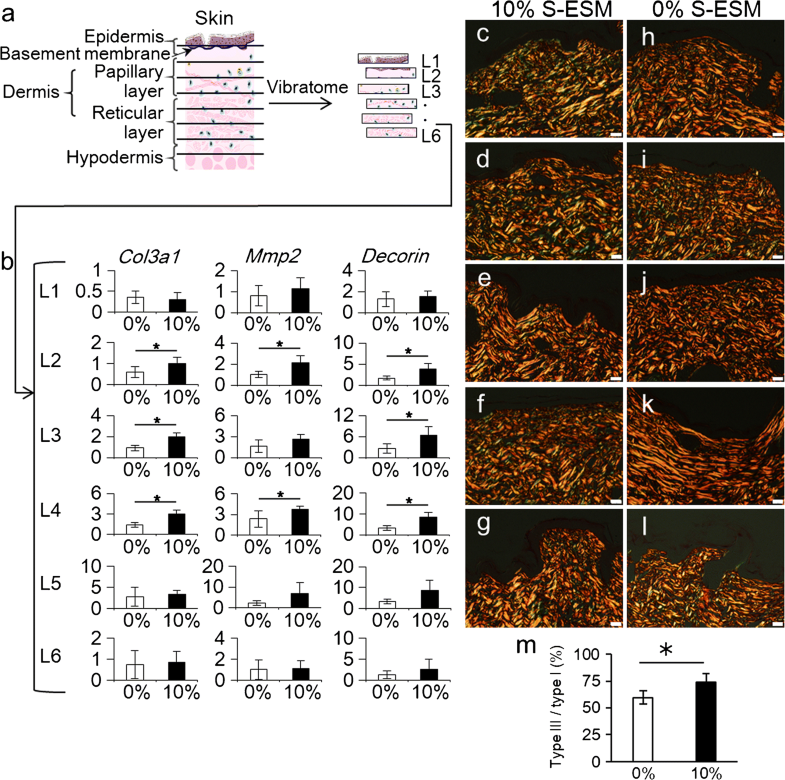 As a result, in the same cellular environment as the dermis, the expression of genes encoding type III collagen, decorin and MMP2, which promote young skin (papillary layer), was induced. However, the effects of S-ESM on skin aging in animal models have not been studied. Therefore, in this study, we first examine the anti-aging effects of type III collagen using collagen gel and human fibroblast cell in vitro and then chicken S-ESM in the dermal papilla using animal and human models to provide a comprehensive understanding of the applications of this material. HDFs derived from infant skin were isolated as described previously (Aiba-Kojima et al. 2007) and were cultured with Dulbecco’s modified Eagle’s medium (Wako Pure Chemical Industries) containing 10% fetal bovine serum (Sigma-Aldrich) and a penicillin–streptomycin–neomycin antibiotic mixture (1×; Gibco). HDFs were used at passage numbers 5–9. For analysis of collagen gel elasticity, type I collagen was prepared in-house from rat tails based on a previously reported method (Yamato et al. 1992) and type III collagen from bovine skin was purchased from Nippi (PSC-3-100-100; Tokyo, Japan). The 2D collagen gel (0.3%) was prepared by mixing type I and III collagen solutions (5.0 mg/mL), 10× medium and reconstruction buffer (0.02 M HEPES, 0.03 M NaHCO3, 0.05 M NaOH). The ratios of type III collagen to total collagen were 0%, 10%, 20%, 40%, 60% and 80%. HDFs were cultured on 2D collagen gels. Final 0.4% collagen gels were prepared using a method similar to that described above and elasticity was measured with a rheometer (RS600; Thermo Electron, Germany). Hydrogel properties, including the storage modulus (G′) and loss modulus (G″), were evaluated using a rheometer (RS600; Thermo Electron; sensor: PP35Ti). All measurements were performed at a shear stress of 0.5 Pa, with a frequency of 1.0 Hz and G′ was plotted for each collagen gel with different type III/I ratios. HDFs were cultured on collagen gels. After culturing for 24 h, cells were fixed using a formalin solution and immunostained with rabbit anti-human collagen III, N-terminal antibodies (Sigma-Aldrich; SAB4500367). Goat anti-rabbit IgG H&L (Alexa Fluor 555; ab150082; Abcam, Cambridge, UK) was used as the secondary antibody. 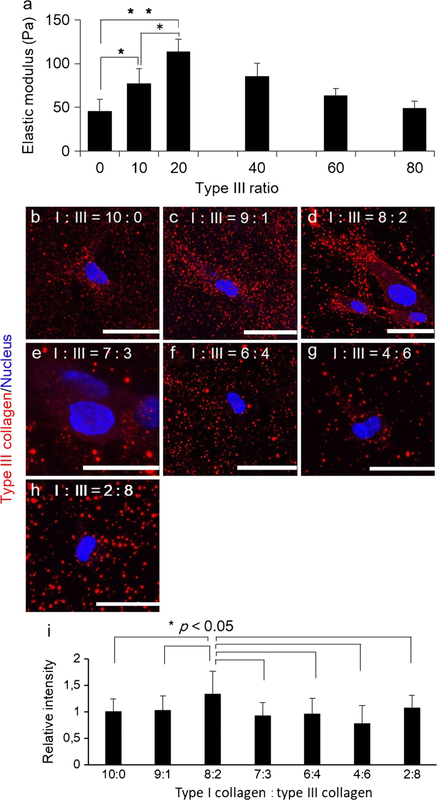 For protein expression analysis, fluorescent images were obtained with a confocal laser microscope and the fluorescence intensity per cell was semi-quantified (n = 15). Relative intensities were normalized and plotted. HDFs were cultured on hetero collagen gels with a type I:type III collagen ratio of 10:0 or 8:2. The cells were stained with 3 μg/mL JC-1 (Molecular Probes, Eugene, OR, USA) for 1 h at 37 °C. JC-1 fluorescence was observed with a confocal laser scanning microscope and the red fluorescence (590 nm)/green fluorescence (527 nm) intensity was obtained from a 1-mm2 area of three observed fields (about 17,400 cells). Relative intensities were plotted. Tissue sections and stained cell images were observed with a Nikon A1RMP microscope and fluorescence intensities were semi-quantified using Nikon NIS-elements software. Animal experiments were conducted with the ethical approval of the University of Tokyo Animal Experiments Committee and Tokyo University of Agriculture and Technology Animal Experiments Committee. Specific pathogen-free hairless mice (Hos: HR-1, 6 weeks of age, male) were purchased from Hoshino Laboratory Animals, Inc. (Ibaraki, Japan). Mice were divided into two experimental groups (n = 9 each) and were treated with 0% S-ESM (control) or 10% (w/v) S-ESM in vehicle (7% butylene glycol, 1% pentylene glycol, 4% glycerin, 0.2% phenoxyethanol aqueous solution). S-ESM was provided by Almado Inc. (Tokyo, Japan). The test solution (40 μL) was applied twice a day to the back skin for 10 days. Skin biopsy samples from each mouse were obtained with a biopsy punch (φ4 mm), washed in phosphate-buffered saline and stored in RNAlater solution (Life Technologies). For the evaluation of each layer, biopsy skin samples were sectioned with a vibratome (Leica VT1200s) into 100-μm-thick sections. Paraffin sections of hairless mouse skin after S-ESM application were prepared and stained with Picrosirius Red (Polysciences, Inc.). Control (n = 5) and 10% S-ESM-treated sections (n = 5) were stained. Images of the stained samples were acquired with a polarizing microscope (Olympus BX53) and then the green area (type III collagen)/red area (type I collagen) was quantified using Image J. Skin samples were crushed using a frozen cell crusher (Cryo-Press, Microtech, Co., Ltd.). From the crushed tissue, total RNA was isolated with TRIzol Reagent (Life Technologies, USA) and purified with Maxwell® 16 Tissue and Cell Total RNA LEV Systems (Promega Co., USA) according to the supplier’s protocol. Total RNA was quantified by spectrophotometry and aliquots of total RNA (200 ng) were applied for cDNA synthesis using a Takara Prime Script RT reagent kit (Perfect Real Time). cDNA synthesis conditions were as follows: 15 min at 37 °C and 15 s at 85 °C. One microliter of cDNA was used for real-time PCR. SYBR Premix Ex TaqTM II (Takara) was used for gene amplification on a Thermal Cycler Dice Real-Time System (Takara). Primers were designed by Sigma-Genosys (Hokkaido, Japan). The sequences are listed in Table 1. Triplicate reactions were performed for each sample. GAPDH was used as an internal control. Approval for this study was obtained from the Ethics Committee of the University of Tokyo. All volunteers were included in the study after providing written informed consent. Fourteen healthy volunteers (all women; age 22–54 years [mean 37.1 ± 12.6 years]) participated in this study. These 14 individuals were randomly divided into the S-ESM group (n = 7; mean age 36.7 ± 4.8 years) and the control group (n = 7; mean age 37.4 ± 5.1 years) and then underwent 12 weeks of supervised application of 1% or 0% S-ESM in vehicle to arm skin. The participants were advised to avoid applying topical drugs or moisturizers on the tested zones during the experiment. The volunteers were acclimated for 15 min in a conditioned room (22 ± 2 °C, 50% ± 10% relative humidity) before the experiment. This was a double-blind, placebo-controlled study. S-ESM was provided by Almado Inc. (Tokyo, Japan). Moisturizing lotion either with 1% S-ESM as a test ingredient or without S-ESM (control) was used. The vehicle was an aqueous solution of 1,3-butylene glycol, glycerol and 1,2-hexanediol. Other minor components of the moisturizer were as follows: PEG-75, lysolecithin, α-glucan oligosaccharide, rose extract, hydrolyzed collagen, sorbitol, phenoxyethanol, Saccharomyces cerevisiae extract, fucoid extract, aloe extract, Panax ginseng extract, Scutellaria root extract, arnica extract, cucumber fruit extract, common English ivy extract, European elder extract, Malva extract, stinging nettle extract and dipropyleneglycol. A moisturizing cream containing 1% S-ESM as a test ingredient or no S-ESM (control) was also used. The base was an aqueous solution of 1,3-butylene glycol and glycerol. Minor components of the cream were as follows: squalene, dimer dilinoleic acid, stearic hydrogenated castor oil, 1,2-hexanediol, hydroxyethyl acrylate/acryloyldimethyl taurine, Polysorbate 60, sorbitan isostearate, xanthan gum, platinum, α-glucan oligosaccharide, hydrolyzed collagen, hyaluronate sodium, phenoxyethanol, rose extract and polysorbate80. Moisturizing lotion and cream were both applied in the morning and evening. The control group consisted of the base formulation without S-ESM. Participants were instructed to avoid using any other product or detergent during the test trial. The test products were applied to the forearm and upper arm skin for 12 weeks twice daily. Skin elasticity was determined using a Cutometer MPA 580 (Courage+Khazaka, Cologne, Germany). Visco-elastic properties were measured according to the manufacturer’s instructions with the following parameters: 300 mbar; on-time, 3 s; off-time, 3 s; R5 = Ur/Ue (net elasticity of the skin without viscous deformation); and R7 = Ur/Uf (biological elasticity) (Krueger et al. 2011). Elasticity was determined by a Cutometer using mode 1, in which measurements were performed with constant negative pressure. The average values of three measurements were used in subsequent calculations. We measured the following four regions: inner and outer sides of the forearm (midway between the wrist and elbow) and inner and outer sides of the upper arm (midway between the acromion and olecranon), with randomization of the left and right sides. To measure the same regions of the participant, we constructed an arm chamber and recorded the region of interest for each participant; thus, the same region was measured every time. The volunteers were acclimated for 15 min in a conditioned room (22 ± 2 °C, 50% ± 10% relative humidity) before the experiment. The effects of S-ESM on skin wrinkles were evaluated in a randomized, double-blind, controlled trial. Measurement of crow’s feet wrinkles was performed at the beginning of the study and after 2 weeks of treatment. The study was approved by the Ethical Committee of Tokyo University of Agriculture and Technology, Tokyo, Japan and all participants provided informed consent for participation. Before conducting each measurement, the face of the participant was washed and she was allowed to sit and rest for 15 min in a room with a controlled environment at 25 ± 1 °C with a relative humidity of 60% ± 5%. Participant satisfaction and adverse reactions experienced using the lotion were assessed at the end of the study. For the double-blind comparative study on the effects of S-ESM on skin wrinkles, 30 healthy women who appeared to have well-defined crow’s feet wrinkles were recruited. Primary exclusion criteria were as follows: being pregnant or breastfeeding, having a history of allergic or cosmetic medicine, or taking hormone replacement therapy. Furthermore, volunteers who had abnormalities of the skin appearing after patch tests with the test lotion or replica reagent were also excluded from the study. For analysis of the effects of S-ESM on face wrinkles, 21 volunteers (mean age 43.9 ± 8.6 years, range 30–56 years) were included in the study after prescreening. The main component of the test sample was 2% S-ESM in aqueous BG. Minor components were as follows: sodium hyaluronate, rose extract, Glycyrrhiza extract and squalene. Components of the control lotion were as follows: water, BG, sodium hyaluronate, rose extract, Glycyrrhiza extract and squalene. The test sample was applied to the corner of the eyes and the control sample was applied to the other side three times daily for 2 weeks. For each application, 0.12 g (three drops) was applied to each side. For each participant, assignment managers randomly assigned test samples for the left and right side of the face. Researchers performed a blinded evaluation of skin wrinkles before and after the 2-week treatment. Two-dimensional images were evaluated with replicas using oblique lighting (wrinkle area ratio). Dermatologists evaluated the wrinkle grade of participants following the Eight-grade Wrinkle Scoring scale (grade 0 to 7) issued by the Japan Cosmetic Industry Association (Task Force Committee for Evaluation of Anti-Aging Function 2007) and values from 1 (a few indistinct, shallow wrinkles observable) to 5 (deeper wrinkles observable) were assigned. Evaluation regions were at the right or left corner of the eye. Skin replicas were collected on the 20 mm × 20 mm area at 5 mm from the lateral angle of the eye, using a silicon-based replica regent (SILFLO; FLXICO Developments Ltd.). The replica images were taken using a super-high pixel digital camera (EOS 6D; Canon) aligned perpendicularly. In the replica, the lines derived from wrinkles on the face surface formed convex structures and application of projecting light provided reproducible shadows according to the shape of the wrinkles. The shadow region in a 10 mm × 10 mm (324 × 324 pixels) area confirmed in both replicas from the pre-test (0 weeks) and those after 2 weeks of treatment near the outer corner of the eyes was considered a landmark and was defined as the wrinkle area (evaluated as the area ratio [%]). Before quantifying the area of replica shadows, binarization processing was performed using ImageJ image analysis software. The threshold setting at the time of binarization processing was set to detect the shape of the shadow, which was made constant between the 0- and 2-week replicas in order to compare change in wrinkles. Using ImageJ, circular shadows with an aspect ratio of 1 were excluded as being irrelevant to wrinkles. Mean values, standard deviations and standard errors were calculated for the area ratios of the S-ESM application area to the S-ESM-free vehicle application area and Student’s t tests were used to calculate the significance of the difference. Questionnaires were given to the participants to evaluate difficulties during use, usage conditions and effectiveness. The mean values and standard errors (SEs) were calculated. Student’s t tests for paired data were used to compare the mean values of the mechanical parameters before and after application of the test cosmetics. Differences with P values of less than 0.05 were considered statistically significant. Chicken ESM has been used as a wound healing dressing in China and Japan and in Sumo wrestlers as a wound healing material in Japan; however, the effects of ESM on cells and tissues have not been clarified. Accordingly, in this study, we explored the effects of ESM on wound skin using full-thickness wounds made on the dorsal skin of slow-healing diabetic mice. Our results showed that ESM tended to produce homogeneous healing tissue and promote thinner layers of type III collagen expression at the early phase of wound healing (Fig. S1). There are 28 collagens expressed in humans (Exposito et al. 2010); type I and III collagens are the major fibril-forming collagens in the skin. To investigate the relationships between type III collagen content in the dermis and skin elasticity, we prepared collagen gels with a different ratio of type I collagen:type III collagen and measured the elastic modulus. The results revealed that the elasticity was highest in the gel with a type III to type I ratio of 20:80 (Fig. 1a). This ratio was the same as that of young skin. Interestingly, immunostaining of the gels with anti-type III collagen antibodies (Fig. 1b–i) showed that type III collagen protein synthesis was also high at this ratio (Fig. 1d). These results showed that a young skin environment was optimal for dermal fibroblasts to synthesize type III collagen. For evaluation of cell physiology, JC-1 was used to investigate the effects of 20% type III collagen gels on mitochondrial activity. 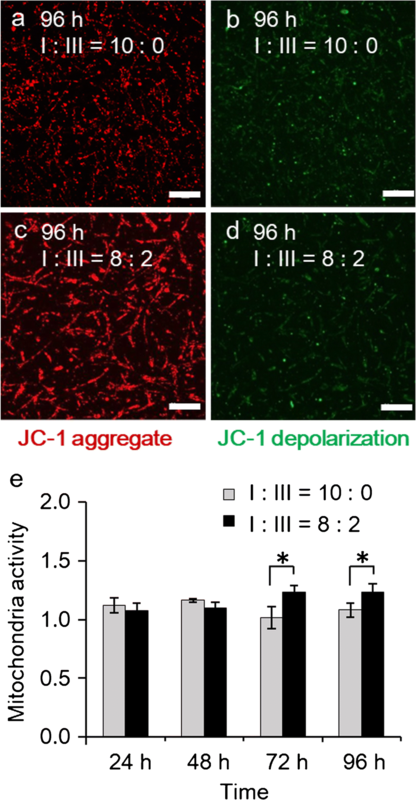 JC-1 accumulates in the mitochondrial membrane in a voltage-dependent manner and can be used to monitor mitochondria activity. In normal polarizing mitochondria, JC-1 aggregates within mitochondria and a fluorescence wavelength shift from green at 527 nm to red at 590 nm occurs after excitation at 490 nm (Cossarizza et al. 1994; Dorrie et al. 2001). In contrast, monomeric JC-1 present in cells with a depolarized mitochondrial membrane emits only green fluorescence at 527 nm. Thus, dermal fibroblasts cultured on gels with various collagen ratios were stained with JC-1 and observed under a microscope (Fig. 2a–d) and the ratio of JC-1 aggregates (red fluorescence)/JC-1 depolarization (green fluorescence) was plotted to determine mitochondrial activity (Fig. 2e). These results showed that the mitochondrial activity of fibroblasts was significantly higher on gels with 20% type III collagen, the proportion observed in the fetal skin (Fig. 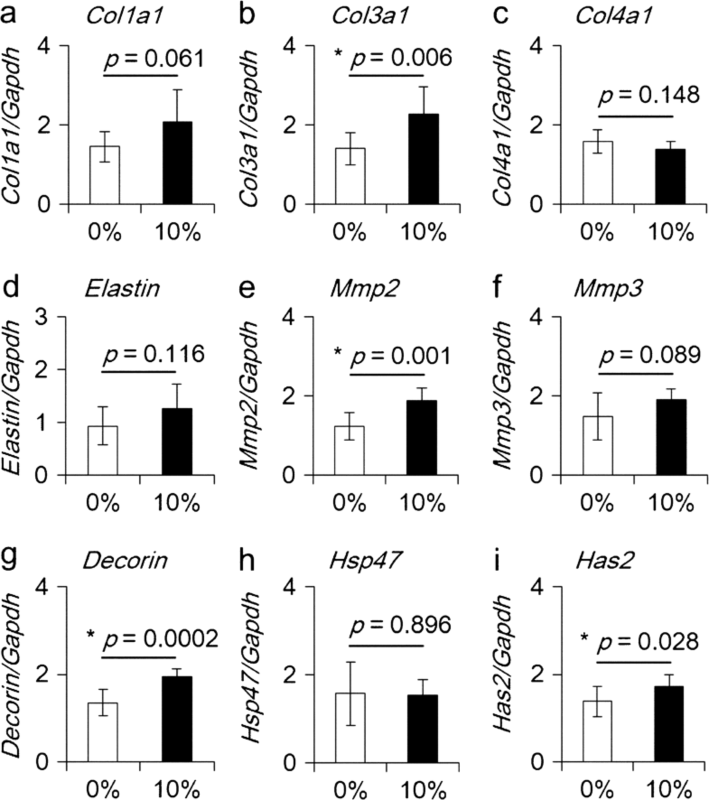 2c, d, e), than the control type I collagen gel (Fig. 2a, b, e). To confirm the responses of HDFs, we analyzed changes in gene expression in the dorsal skin of hairless mice after application of S-ESM (Fig. 3a–i). The results showed that extracellular matrix (ECM) molecules, such as type III collagen (Fig. 3b), decorin (Fig. 3g), MMP2 (Fig. 3e) and hyaluronan synthase 2 (Fig. 3i), were upregulated significantly following application of 10% S-ESM solution compared with those in the 0% S-ESM control. The levels of type I collagen (Fig. 3a), elastin (Fig. 3d) and MMP3 (Fig. 3f) were also upregulated; however, the differences were not significant. Heat shock protein 47 (Fig. 3h) and type IV (Fig. 3c) collagen were not upregulated. These results suggested that topical S-ESM application may induce upregulation of gene expression associated with synthesis and degradation of the ECM in dermal tissue. Next, we analyzed gene expression in skin sections from mice (Fig. 4a). Significant increases in the expression of genes encoding type III collagen, decorin and MMP2 were confirmed in L2–L4 of the papillary dermis (Fig. 4b; Fig. S2). Picrosirius Red staining of skin sections after S-ESM application showed significant increases in type III collagen fibers (Fig. 4c–m; Fig. S3). We surprisingly found that the genes encoding type III collagen, decorin and MMP2, which form an environment similar to that of young papillary dermal skin, were induced both in an in vitro system in which S-ESM was covalently attached to an artificial phospholipid biomimetic interface (Ishihara and Takai 2009) containing the PMBN (2-methacryloyloxyethyl phosphorylcholine) polymer (Konno et al. 2004) on the surface of the tissue culture dishes and in a hairless mouse in vivo study as described above; therefore, we expected that an application of S-ESM on human skin may alter ECM gene expression in HDFs and skin elasticity. Accordingly, in this study, 1% S-ESM solution was applied to the arms of women for 12 weeks to evaluate skin elasticity after daily S-ESM application (Fig. 5). 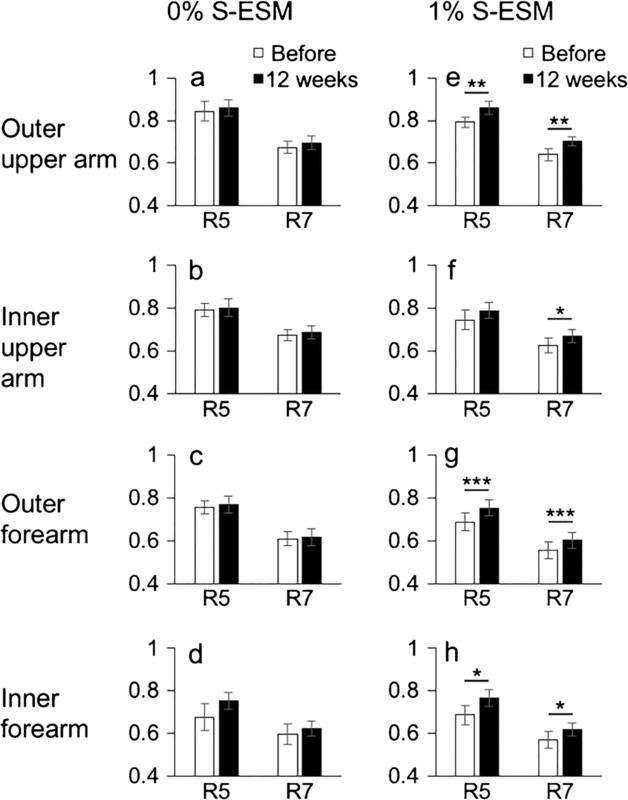 Skin elasticity was determined using skin biophysical techniques (Escoffier et al. 1989). Biological elasticity was increased significantly at all measurement regions of the arm compared with that before treatment. Additionally, net elasticity of the skin without viscous deformation was also significantly increased in the outer upper arm (Fig. 5e), outer forearm (Fig. 5g) and inner forearm regions (Fig. 5h) compared with that before application of 1% S-ESM lotion. In contrast, elasticity parameters of the skin were not affected at the control site (Fig. 5a–d) where the control lotion (0% S-ESM) was applied before and after application. As described above, skin wrinkles (Vierkotter et al. 2015) and elasticity (Çildağ and Çildağ 2017) are also correlated with lung fibrosis. In view of skin geroscience, to obtain additional information about the rejuvenation of mechanical properties of the extracellular matrix by S-ESM, a total of 21 women were recruited. 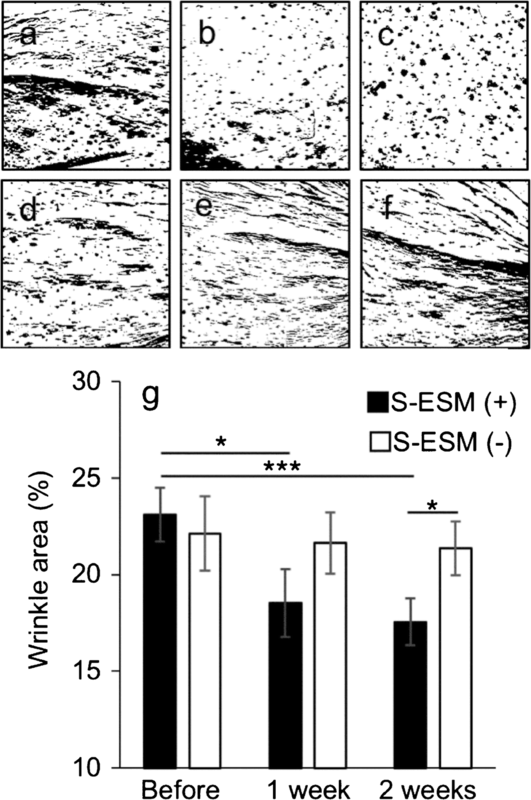 Typical wrinkle replica binarization images showed that the wrinkle area decreased after S-ESM treatment (Fig. 6a–c) but not control treatment without eggshell membrane (Fig. 6d–f). Additionally, as shown in (Fig. 6g), the wrinkle area ratio in replica image analysis decreased after S-ESM lotion treatment. The wrinkle area ratio decreased significantly in the S-ESM group from 23.11% ± 1.41% before application to 18.54% ± 1.76% after 1 week and 17.55% ± 1.21% after 2 weeks (p = 0.027 before application and 1 week after application; p = 0.0003 before application and 2 weeks after applications). In contrast, the ratio did not change significantly for the control group (22.13% ± 1.94% before application; 21.63% ± 1.60% after 1 week; 21.35% ± 1.40% after 2 weeks). These results showed that S-ESM had significant effects on wrinkle improvement. Type III collagen is a type of fibrillar collagen and a homotrimer of three α1(III) chains. In the skin, papillary dermis is rich in type III collagen. However, the function of type III collagen in the skin has not yet been fully elucidated. 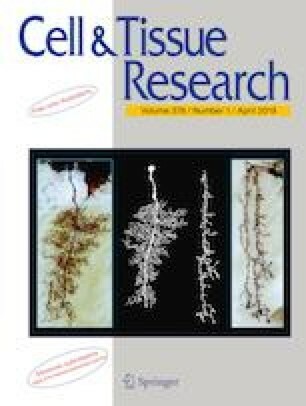 In this study, we first focused on type III collagen and showed that a gel with a ratio of 20% type III collagen/80% type I collagen, similar to that of the baby skin, resulted in higher elasticity and higher gene expression of type III collagen and a higher HDF mitochondrial activity than that with 100% type I collagen (p < 0.05; Fig. 1). Furthermore, ESM application to mice skin showed that the expression of genes encoding type III collagen, decorin and MMP2 was increased and the levels of type III collagen were also elevated (Fig. 3), as demonstrated by Picrosirius red staining–polarization microscopy that distinguishes collagen fiber type in S-ESM-treated pupillary skin (Fig. 4; Fig. S2 and Fig. S3) through biochemical and histochemical analyses after application of ESM. Moreover, ESM application improved human skin elasticity (Fig. 5). Thus, increased type III collagen induced by S-ESM application in the skin was related to increased skin elasticity. Type III collagen fibers are thinner than type I collagen fibers and have a flexible structure (Flexi-rod structure) (Parkin et al. 2017). The primary function of type III collagen is fibril formation of type I collagen (Liu et al. 1997). As a component of the ECM, type III collagen is essential not only for the developing skin and cardiovascular system but also to maintain internal organs and adult skin (Olsen 1995). Type III collagen is associated with skin elasticity and patients with deletion of type III collagen exhibit loss of skin elasticity and blood vessel formation, resulting in Ehlers–Danlos syndrome (Kontusaari et al. 1990; Kuivaniemi et al. 1995; Prockop and Kivirikko 1984). Type III collagen is present at higher levels in the papillary dermis (just below the basal membrane) than in the reticular dermis (Meigel et al. 1977; Ramshaw 1986; Weber et al. 1984). Additionally, decorin, which regulates the assembly of collagen fibrils, is also abundant in the papillary dermis (Reed and Iozzo 2002; Schonherr et al. 1993). However, age-related changes in type III collagen and decorin in the skin affect the physical properties of the skin (Carrino et al. 2000, 2003; Ramshaw 1986). Notably, in this study, we found that gels with type III collagen to type I collagen ratios of 20:80 had the highest elasticity and HDF mitochondrial activity. Additionally, HDFs on the gel changed to a spherical form (similar to stem cells) from a spindle-shaped form (similar to fibroblasts) (Fig. S4). This ratio (III:I = 20:80) was similar to that observed in the baby skin (Smith et al. 1986). Although the detailed molecular mechanisms have not yet been clarified, an ECM environment with moderate elasticity seems to be suitable for cells and ESM can induce a healthy state in the skin, improving the functions of dermal and epidermal cells. ESM application also induced decorin and MMP2 in the papillary layer in this study in addition to type III collagen. The papillary dermis just below the basal membrane contains skin stem cells (Li et al. 2010) and capillaries develop to supply nutrients to dermal fibroblasts and epidermal basal cells in this region (Yen and Braverman 1976). Stem cells are maintained in elastic and soft tissues (Winer et al. 2009) and tissue stiffness resulting from prolonged ECM changes results in progression of the diseased state (Handorf et al. 2015). The function of decorin was not analyzed in this study. Gel analyses using decorin and other ECM molecules in type I collagen may be useful to elucidate the different mechanisms between papillary and reticular dermis in terms of their material quality. Proteoglycans, elastin and hyaluronic acid in the skin are viscoelastic molecules. Elastin forms elastic fibers in the skin and decreases with age (Pasquali-Ronchetti and Baccarani-Contri 1997; Uitto 2008). Elastic fibers increase from the papillary dermis to the reticular dermis (Vitellaro-Zuccarello et al. 1994). Our results did not reveal the effects of ESM on elastin expression. Therefore, the effects of ESM seemed to be specific to the papillary dermis and to modulate the ECM environment of the papillary layer, similar to that in the young state. Dryness, roughness and wrinkles characterize physiologically aged skin. With aging, dermal collagen synthesis and cell populations decrease and MMP levels increase (Chung et al. 2001; Varani et al. 2000). Additionally, dermal thickness decreases as dermal collagen content is reduced (Castelo-Branco et al. 1994; Kurban and Bhawan 1990). The ECM, which contains collagen fibers, elastin, proteoglycans, glycosaminoglycans and adhesion molecules and makes up the dermis, functions to maintain mechanical tension and elasticity and is involved in tissue support and crosslinking and as a physical border. Therefore, loss of ECM components decreases skin elasticity (Berardesca et al. 1991; Nishimori et al. 2001; Ventre et al. 2009). Interestingly, poor trunk flexibility (one of the components of physical fitness) is associated with arterial stiffening (Yamamoto et al. 2009). In summary, in this study, we found that ESM had anti-aging effects by improving the ECM environment in the papillary layer. ESM is available worldwide and is a biomaterial with application in medical, food and cosmetic fields. Thus, natural products, such as ESM, from traditional Asian medicine may provide new approaches to improving health. We thank Prof. T. Watanabe of Tokyo University of Agriculture and Technology (TUAT) for administrative assistance at the Material Health Science Laboratory, Prof. K. Misawa (TUAT) for use of laser scanning microscopy, Prof. H. Saito for polarizing microscopy, Prof. K. Yokozawa (former professor, Tokyo Women University) for assistance with the human study and Dr. Tomoko Kamishima (MD, PhD, dermatologist) for supervising the facial wrinkle study. We also greatly appreciate the participation of the volunteers. Animal experiments were conducted with the ethical approval of the University of Tokyo Animal Experiments Committee and Tokyo University of Agriculture and Technology Animal Experiments Committee. Approval for this study was obtained from the Ethics Committee of the University of Tokyo.